July 12, 2013 in "Life"
Like probably all new parents, Chris and I spend all of our time trying to juggle baby wrangling with household chores plus work at TFA. If I don't have a baby in my arms (and most of the time even if I do) I'm running around trying to get things done, or sneak in a few minutes of computer work. But the other day the most amazing thing happened - and I always forget that it's one of my favourite things until it happens - completely out of the blue, the power went out! The house went completely silent. The electricity didn't care that I had lists and lists of things that I absolutely had to get done that day. It didn't know that I had thrown a mini tantrum that morning because there just wasn't time to do everything that I had to do. It just up and went silent. And it was amazing. It was like a giant exhale. All the humming and vibrating noises that we're so used to a house always making disappeared and we were left to just hang out. I stepped out of the office and into the living room where Chris was playing with Rowan and joined them on the floor. The power outage didn't last long, maybe an hour and a half or so. Not long enough for the heat to take over the house, for the food in the fridge to go bad or for anybody to be bothered by it. Just long enough to make us realize that sometimes you just need to be forced to shut down. That photo up there is of my father's mom, my Grandmaman, meeting her most recent great-grandchild, my Rowan. My family recently lost a very special member of our clan. My aunt, my cousin's mother, my father's sister, my Grandmaman's daughter. She was so much to all of us and the loss weighs heavily on our hearts. My aunt Nicole was a stitcher, a very talented needlecraft artist. I have a piece of her work that she gave to Chris and I for our wedding. I cherish it now more than ever, it's incredible how much meaning each of those stitches holds. 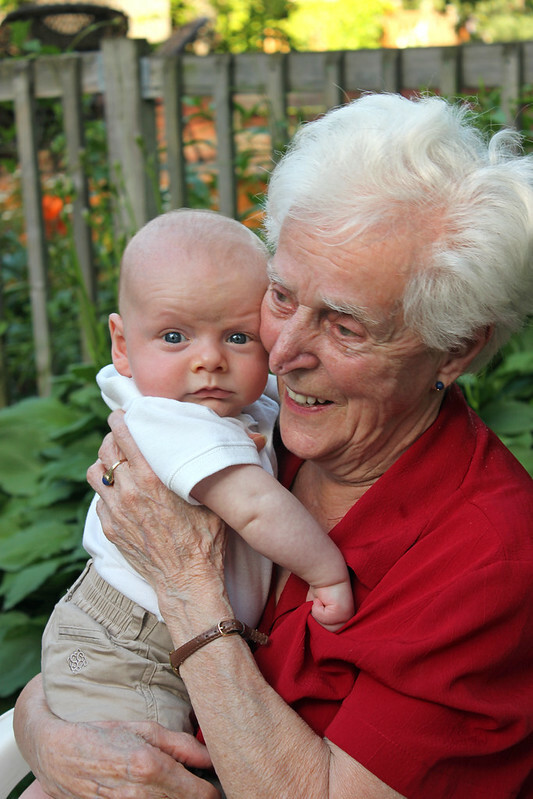 For just a moment, an old lady is able to lovingly smile at the baby in her arms, even after having just said goodbye to the daughter who was once her own first baby. This moment I was able to look at my Grandmother with my son and know how lucky I am and how amazing this is for all three of us. For just a second we were able to forget about everything going on and just be in that special moment.